One-ply bond receipt rolls with sensemark deliver the finest quality in both image and performance in teller and proofing machines. 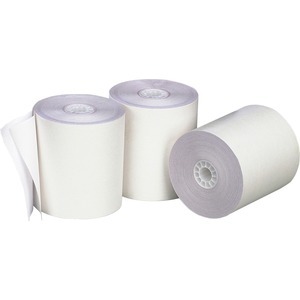 Premium-quality paper is 100 percent lint-free and offers a smooth, nonsmear surface and end-of-roll warning mark. Paper comes in a self-contained roll and does not require a ribbon to create an image. Use in teller and proofing machines, including FMS100 Teller, NCR 1770, 1780, 2262, 177J2, 2251, 2261, 2270, 5000, 5067 and 5267.